Built in inclinometer/tilt sensor – Displays up to 360° in 2 axis, allows accurate degree measurement. 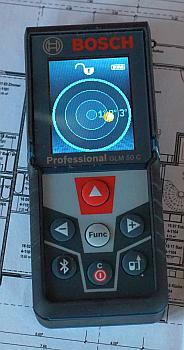 It is not difficult at all to measure using the GLM 50C. You can choose functions by selecting easy to understand icons on the monitor screen. The display is easy to read and useful animations support the selection of functions and settings. The flip-display rotates thanks the inclinometer into the portrait- or the landscape-mode. The buttons need a defined force to push them. Each keystroke can be signaled by a beep if you like that. 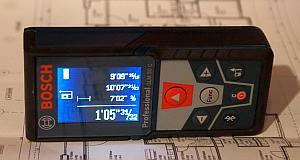 If you use the app “GLM measure & document” you can control the GLM 50 C Professional remotely via Bluetooth. The Bluetooth interface and the app work with Android and iOS smartphones and tablets. The app also helps to document measurements. We have described the possibilities of the app in an article about the interfaces of the GLM 100 C Professional. Range from 6 in. up to 165 ft. The GLM 50 C Professional is a rather handy rangefinder and is smaller and lighter compared to the GLM 100 C. An important difference between these is that the GLM 50 C is powered by batteries instead of a rechargeable battery. But this is no disadvantage, because dead batteries can be replaced quickly and easily. Charging a battery during a measurement project, however, is complicated. The nylon carrying case has side walls made of flexible material, yet in my opinion it is a little too close. The GLM 50 C hooks up easily when it gets stuck in the case. 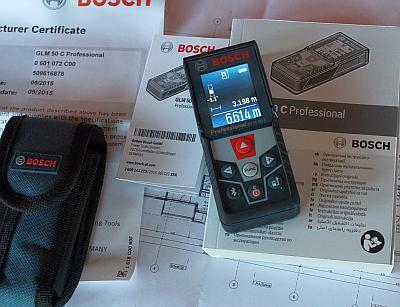 Like all new Bosch Professional laser measurers the GLM 50 C suits the ISO standard 16331-1. Therefore its precision is proven. If you compare the GLM 50 C with the top rangefinder in the Bosch Professional program (GLM 100 C) you notice that the smaller one does a lot equally well as the top model. Although its price is well below that of the GLM 100 C.
Check availability and price of the Bosch GLM 50 C Professional. The Bosch GLM 50 C performs, with few exceptions, almost as well as the GLM 100 C but at a significantly lower price. Which are the main areas of application?